We are moving into fall which means the day are getting shorter and darker which means it even more important to keep an eye on our energy levels. Our daily food has such an enormous influence on how we feel, live, look and perform. 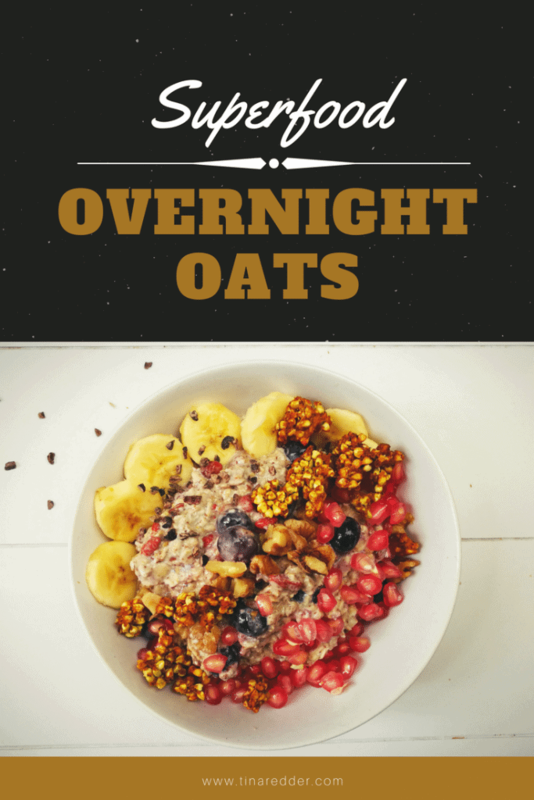 With the right foods we can keep fatigue away by just eating whole, unprocessed plant based foods like these delicious superfood overnight oats! Our bodies thrive on a nutrient rich diet, as much nutrients per calorie as possible. Empty foods has nothing to give us except leaving the body tired and even ore hungry. Our foods are not as rich in nutrients as they were long time ago and that’s where it can be helpful to sometimes add concentrated superfoods like raw greens and fruit powders. And when we can leave all or some of our energy sucking habits and foods behind like lack of sleep, stress, coffee, white sugar, processed foods and animal products fatigue will be something of the past. To keep the red blood cells fit and strong, full of oxygen, our bodies energized we could keep an extra eye on nutrients like magnesium, iron, folate and the vitamin B family. Here I have made overnight oats, delicious and creamy, made by leaving the oats to soak overnight as the name says lol! Wonderful to prepare the night before, rich in vitamins, fiber and minerals. One of my favorite fall fruit is pomegranate. Besides a whole list of impressive properties pomegranates are also rich in iron, needed for a healthy, oxygen rich blood. I also added some pomegranate powder which is optional but it sure boosts the nutrient profile. Raw cacao powder and cacao nibs are natural anti depressants! They feed our happy hormones and are also rich in iron and magnesium. Goji berries are these tiny anti oxidant bombs that have been consumed for thousands of years. 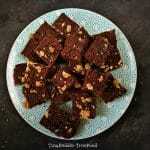 Walnuts and flax are a wonderful source of omega , bananas pure energy and potassium. Oatmeal lowers cholesterol, is filling, releases slow and steady energy and is rich in fiber. Blueberries are a true superfood as is, I try to add a portion berries every day to my food. 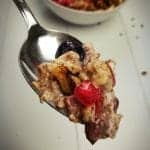 Overnight oats are super easy to make, just add all the ingredients except for the topping goodies, add the “milk”, shake and let it sit overnight or at least for a couple of hours. 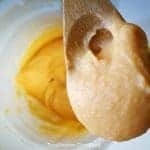 Your liquid should cover everything but not too much. The berries will get nice and soft and the pomegranate powder adds a lovely pink color. 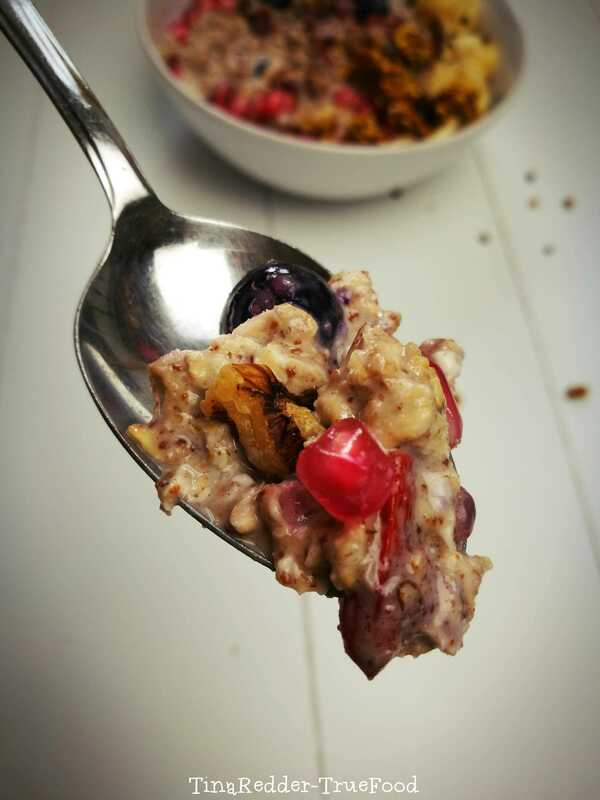 It all gets creamy and gooey when all the liquid is soaked up by the oats, berries and flax. This travels really well. Today I scooped it in a bowl and added some crunchy toppings like the chopped walnuts, cacao nibs, buckwheat pumpkin granola and may be some coconut flakes and the other half of the banana, sliced. To keep fall inspired I added some fresh crunchy pomegranate seeds. Yum, just delicious! Enough energy and nutrients to start the day with. There are many wonderful combinations with overnight oats. Add cacao for a chocolaty version, may be some nut butter. Cinnamon, raisins and grated apple for an apple pie feel …. Let me know if you tried it! If you would like to safe this recipe you can pin the picture below to your Pinterest board! Add all the ingredients to a glass jar, add milk, close and shake. You can also stir but shaking is much easier, your jar needs to be big enough. Chill for a night in the fridge or for at least two to three hours to let it become creamy and thick. It travels well in the jar, you can also take the toppings along in a separate jar, all good!